Open Qlik Sense and add the 'Vizlib bar Chart' extension to a sheet. Fully customizable Multi-Bar Chart with rich formatting options. Wide selection of symbols as data point representations. Ability to add reference lines for both the x and the y-axis or benchmark bars for metrics. The Vizlib BarChart supports either one dimension with multiple metrics or two dimensions with one metric. The data section permits you to add dimensions or metrics dynamically and decide whether they should be used directly or be added as alternative dimensions. Gives you the ability to specify one color for the measures, overriding any global color settings. You can also specify the bar color using a Qlik expression. Gives you the ability to specify the bar opacity (100% represents full opacity) for the measures bars. Allow you to create another bar layer behind the existing bars for benchmarking purposes. The benchmark value (which can also be an expression) defines the value and height of the benchmark bars. Show/Hides data values for the particular measures additional settings on the bar chart values can be found under appearance. Provides you with the ability to accumulate values over the dimension. This is particularly valuable when using time dimensions and you wish to see the increments added up to an overall total at the end of the period. 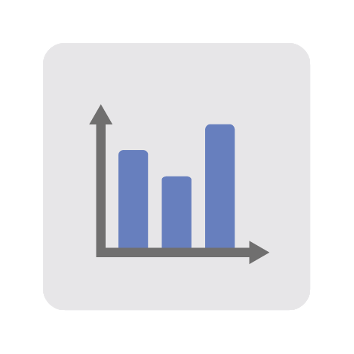 The Vizlib Bar Chart supports Reference Lines for both the y-Axis and for the x-Axis. Only displays if you have more than one metric or dimension. Choose from one of three different representation types. Fixed wrong position of tooltips in mashups with scrollbars. Added option to define custom tooltips (with HTML support) on each measure. Auto formatting was not getting applied on bar data values. Fixed wrong tooltip position when the browser has horizontal scroll bar. Bar chart was exceeding range limit in some scenarios. Bar chart color expression was returning some undesired color in some situations. Fixed some rendering issues in QS Desktop. Bar tooltip was in the wrong position when using the browser scroll. Improved conversion from native bar chart -> vizlib bar chart. Fixed data handling data limit. In some scenarios was not loading all the data and leaving a white screen on the bar chart. Barchart stop rendering after selecting a vizlib filter in some scenarios. Big performance improvements on both minicharts and chart rendering (specially visible on IE). Disabled selections for null values (was returning a Qlik engine error when selected). Null values in 2nd dimension had a black background instead of stripes (like in 1st dimensions). When the x-axis was disabled the whole chart was not rendering properly. Data values text cuts in some scenarios. Legend tiles labels text cuts in some scenarios. Show all data values was not downloading all Qlik data pages (when bigger than 5k data rows). When date values were placed at the bottom it was overlapping with the x-axis. Dimension title from a Master Item dimension, was not inheriting the label attribute. Outter right reference line labels was overlaping the secondary-y axis. Tooltip tile was not inheriting the color opacity. Data handling > Show all data was not loading all the data pages. Legend labels were getting cut-off. Implemented some performance improvements around the minimaps. Alternative measure labels were not resolving expressions within variables. When the bar color in measure was set to custom, the legend tile was not getting updated. When the bar had a null value in Safari the background was white. When the same expression was entered twice with the same label it was not identified as a new expression. The Bar Chart was not working when placed on the same sheet as the Vizlib Sankey Chart. Legend tile was not inheriting the bar opacity. Legend align was not working in Qlik Sense Desktop. Tooltip data was showing a different format than the axis in some scenarios. Tooltip was misplaced sometimes when the Bar Chart was embedded into an iFrame. Opacity was not applied to legend tiles for 1dim + n measures. Bars misplacement on secondary axis when the formatting settings was changed. Corrected y/y2 axis label placement wherein sometimes it was overlapping the axis. Dimension label was overlapping the axis sometimes on IE. Wasn't updating some data points after applying a selection on IE. Fixed visualisation issues in stack mode for null values. Bar opacity slider was not working. The legend option was not available anymore on the property panel and in newly created bar charts. In some scenarios in combination with other Vizlib Extensions, the tooltip was showing a string HTML color instead of the actual color. Legend labels were not displayed when using a custom color palette. Enhanced UX on the property panel around Single color mode in the Color & Legend section. Fixed BarChart sorting where in some scenarios were not sorting properly. Secondary Axis is now available. Some Formatting Options were fixed. Stability of data values was improved. Fixed issue empty values in dimensions would generate unexpected behaviour of the Bar Chart. When data values was enabled, some margin was added in the y-axis showing negative values on the axis despite not having negative values. Fixed code collision with Vizlib Filter where the two extensions won't render together. Vizlib Bar Chart does not support native PDF/PPT printing (it does, however, support nPrinting).